The Hong Kong Virtuoso Chorus (HKVC) was invited to attend the “Ode To Joy Concert of Ten Thousand,” which was organized by the Hong Kong Federation of Youth Groups, Opera Hong Kong and RTHK, at the Hong Kong Coliseum in Hung Hom. The event featured many youth choir groups and 10,000 young people singing Beethoven’s Ninth Symphony “Ode To Joy”, the ninth symphony of Beethoven, to set a Guinness World Record. 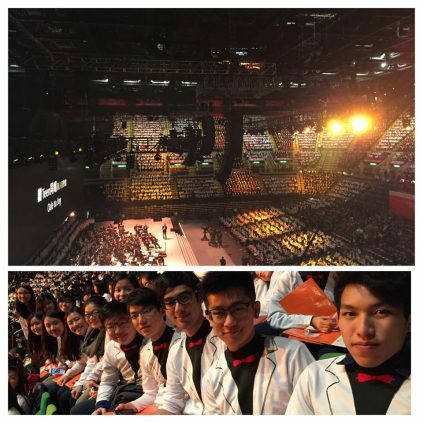 This choir performance was the HKVC’s first at the Hong Kong Coliseum. It was also the first concert in which the HKVC performed two famous and challenging foreign-language songs (Carmen Les voici in French and Ode To Joy in German).